Finally got that bobble head signed, now its time to display it! This single bobblehead case uses the highest quality cast acrylic lid and includes your favorite MLB team logo. 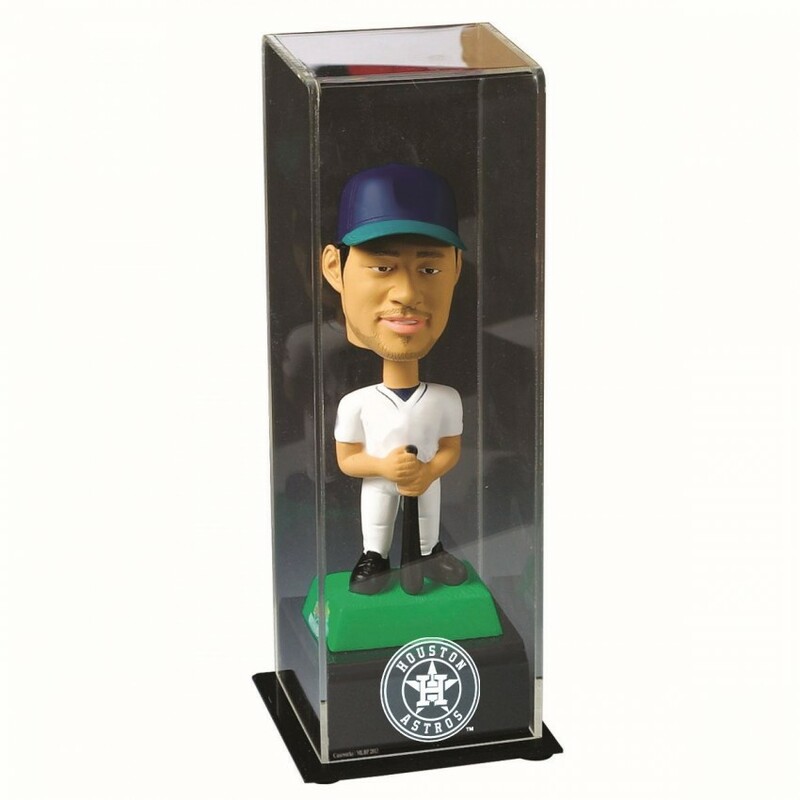 Measures 5 1/4"W x 9 1/2"H x 5 3/4"D. Bobblehead not included. Made in USA. Our Mahogany Framed 9 Hockey Puck "Case Up" Wall Mountable Display will Enhance your Hockey Collecti.. The Kansas Jayhawks wall-mountable basketball display case is made of 1/8"-thick acrylic with a blac.. The Dallas Mavericks wall mountable basketball display case is made of 1/8'' thick acrylic with a br..
Machine-Made Tufted. 100% Premium Nylon Pile. Made in the USA! Oregon 10'9"x13'2" College Home Court..
Limited-edition handmade Serigraph celebrates Alex Gordon, the Kansas City Royals, the 2014 World Se.. This San Francisco 49ers Riddell Pro Line authentic helmet has been personally hand-signed by wide r.. Coaches Choice mini helmet case. The lid is made from the highest quality 1/8" cast acrylic. The bas.. The Texas Longhorns Golden Classic football display case comes with a black acrylic base and gold co.. The easy, open-and-close, cabinet style, NFL Licensed, Genuine Brown Wood framed jersey case now inc.. Score! Ultimate Collectors 4 Puck Display case has a lid made of the highest quality 1/8" cast acryl..
Free Up Your Desk Space with a "Case-Up." This wall mountable display allows you to display your ful..